Tired of boring findings? Try unique earring supplies to things interesting! These are fancy interpretations on the original ear wire concept. 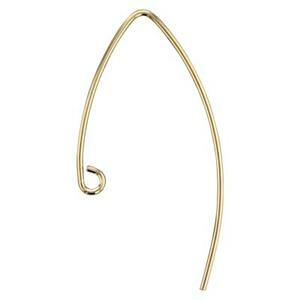 All the styles shown here have the shaped wire hook that easily slips through ear piercings. However, these styles offer unique sizes, shapes and ornaments to spice up your jewelry designs. All our earring findings are sold by the each; so a 10 piece pack would contain 5 pairs of earrings, for example. Always order multiples of two to get complete pairs. Halstead is best known for sterling silver and gold filled jewelry supplies for professional jewelers. Find out why for yourself! Don't forget our favorite E28 Stopper Clutches so you never lose an earring again. 14x25.3mm 20ga Marquise Earwire, 1.6mm Open Ring ID. Order 2pcs to get one pair of earrings.